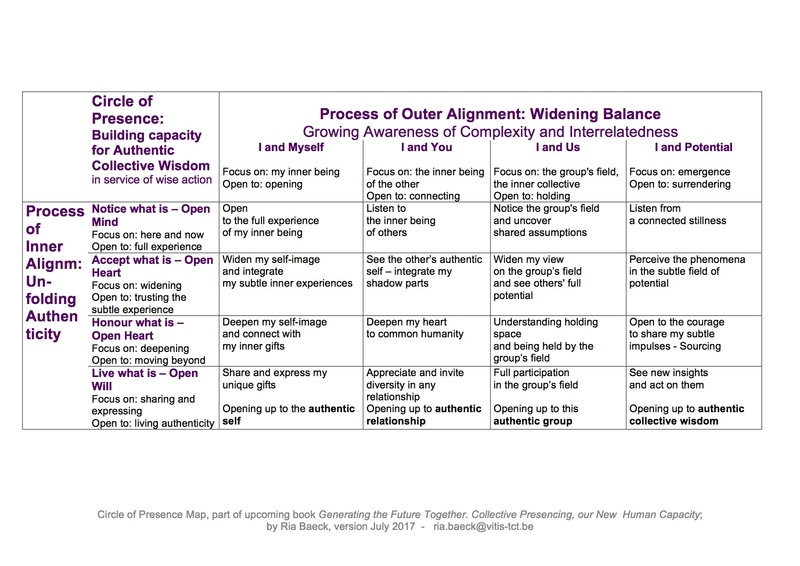 The previous chapters have described the building blocks of a map offering an overview of all the levels and domains that come into play in becoming and being a Circle of Presence – a group that, through the practices described, has achieved access to its authentic and unique collective wisdom. In this section, we will explore more deeply the dynamics implicit in this map. Building this container for authentic collective wisdom together can be described in terms of a process unfolding along two dimensions. The vertical dimension – unfolding authenticity – invites us to become aware of and grounded in what is real and to clear away what prevents us from being fully present. This is the unfolding of our own shared and collective authenticity. This process of inner alignment brings us into ever deeper connection with authenticity freed from limiting conditioning. This process can also be described as a movement of unfolding resonance between our mental, emotional, physical and subtle bodies. Step by step we can reintegrate our shadow parts – in emotion, thought and action; as we journey, we are cultivating our inner leadership. We become able to experience moments of stillness within ourselves, and can experience ourselves as a kind of channel that can resonate with what is present. Through or as this channel, it is easier to relate to the subtle realms, to spirit and source. The horizontal dimension – widening balance – is a parallel process whereby we learn to open ourselves and connect with an ever-expanding reality, extending from I myself out to the other(s) and beyond that to the future potential of this group. This widening balance is about being aware of greater complexity and interconnectedness, experiencing a growing connection with more and more of what is outside of you. As we reach out to others in the circle, and beyond that into the space and the environment we are in, and beyond that to the other beings on the planet (human, animal, vegetable and mineral), we can sense our way into and ever more expansive outer alignment. At moments we can have a deep experience of balance and harmony. This is the level of outer alignment we seek. These two dimensions of unfolding authenticity and widening balance – the inner and outer alignment – expand and entwine. One way of visualising this is as two upward spirals intertwining and supporting each other. More accurate still would be an image of tendrils of smoke, all intermingling and co-creating a unified image. I distinguish between the processes of inner and outer alignment for the sake of clarity and ease of understanding only. These two movements are happening at the same time; they are fully entangled as aspects of the same thing. A step in one domain will make it easier to advance in another domain also. As a rule of thumb to follow, the further we develop through this map, the more ease and beauty we will experience. Prototyping and innovation will be natural outcomes of the process.